We Impress Blinds offer a comprehensive range of quality window blinds in Slough, Berkshire areas at very cost effective prices. Having a huge collection of window blinds and experienced team, we are providing the best window covering treatments and bespoke solution to all our clients in Slough and all over the UK. 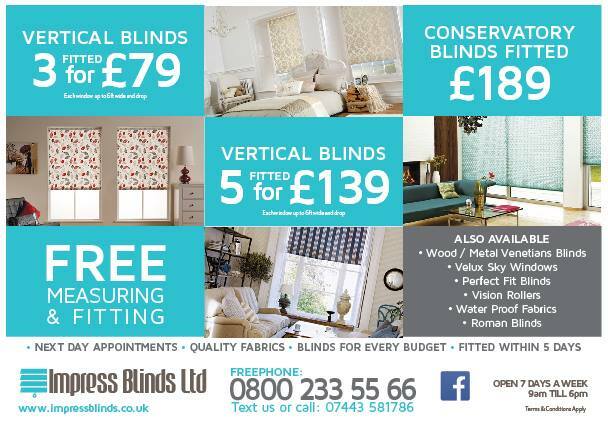 You can choose from our huge variety of roller blinds, roman blinds, conservatory blinds, vertical blinds, wood blinds, vision blinds and metal Venetian blinds. With multiple style, colour and design options, you can give a personal touch to your blinds that compliment your home or office design. Our custom made to measure blinds are easy to operate and reduce the flow of heat while allowing you to control the light level in your room. Providing UK manufactured window blinds comply with all new regulations, we ensure you they are eco friendly and child safe. All these significant properties made our window blinds perfect for both residential and commercial premises. Impress Blinds has maintained its highest standard by providing quality, value and ensuring satisfaction. This is why we have hundreds of thousands of happy and satisfied customers in the Slough Berkshire areas and across UK who come time and time again for the best window covering solutions. Moreover, we give free advice, measuring services and free installation to all our Slough clients as well as all our clients in UK. Choose the best quality and cheap window blinds at the comfort of your home. Benefit from our special rates and purchase 3 roller blinds for £119 and 3 vertical blinds for £79 with a selection of multiple colors and designs.